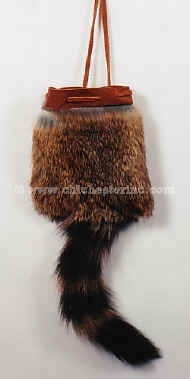 This 4" by 4" (10 cm x 10 cm) rabbit fur bag, which has a real raccoon tail, hangs on a 13" (33 cm) strap. Original design by Paul Crosby. Other sizes are available available on a custom-order basis. Bag: Genus and species: Oryctolagus cuniculus. Tail: Genus and species: Procyon lotor.